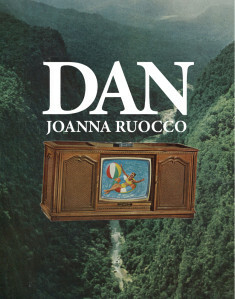 Joanna Ruocco’s brilliant new novel, Dan, begins by presenting the reader with an impossibility: “If only there weren’t leap years, thought Melba. Every 365 days, the calendar would lose several hours and, by now, there wouldn’t be any days left at all.” This somewhat unsettling observation captures the spirit of the book with wit and precision. As the narrative unfolds, Ruocco presents us with a world which, much like the celestial orbits described in the opening scene, appears familiar. Yet the small hamlet of Dan, and the stars that govern its days and nights, prove to be rife with contradictions and paradoxes. Readers will encounter a world that is inherently unstable, despite its close resemblance to our own. “Wives,” “mothers,” “safe-breakers,” “victims,” and “patients” are all to be feared, and those who can spell with great accuracy remain equally suspect in the eyes of local authorities. Just as everyday tasks and the roles we inhabit are rendered suddenly strange, so too is language itself. Words no longer mean what we expect them to, and grammar does little to lend a sense of order to the delightfully subversive language of the book. With that in mind, Ruocco offers us a beautiful matching of form and content, particularly as her ongoing defamiliarizion of the everyday is skillfully enacted in the novel’s smallest stylistic choices. Ruocco’s use of received grammatical structures to deliver unconventional, and often disconcerting, content is especially impressive. Throughout the book, readers encounter pristine, grammatically impeccable sentences, populated by what seem like familiar words. For example, Ruocco writes, “Grady Help had once been a victim, and as such was not usually spoken to directly. Melba had herself inquired about Grady Help from time to time…” What’s perhaps most fascinating about this passage is the way that Ruocco’s grammatical precision, and her purposefully formal tone, evoke a variety of preconceived ideas on the part of the reader. We are led to expect language that adheres to the underlying logic of conventional grammar, its implicit hierarchies and value judgments. Instead, we encounter language that has been appropriated and redefined on Ruocco’s own terms. “Victims” are no longer passive individuals, but have instead been imbued with greater agency, appearing formidable, even fear-inducing. In many ways, Ruocco makes us see grammar as strange, a feeble attempt to lend order to unruly language. Language that is slippery, equivocal, and constantly shifting. I truly admire the way that Ruocco undermines grammar and its underlying logic from within, showing us that these received structures of thinking and communicating can be appropriated and made to deliver unexpected, wonderfully subversive content. Here Ruocco presents us with logically structured sentences, which seem to suggest the heroine’s process of reasoning through various phenomena in the world around her. What’s perhaps most interesting about this passage is the provocative discontinuity between style and content. Despite Ruocco’s very deductive, rationally structured sentences, readers encounter a narrative that is wonderfully unfamiliar, strange, and illogical. This thought-provoking disconnect between style and content suggests the inherent instability of reason, as well as the definitions of logic that circulate within culture. I’m intrigued by Ruocco’s use of subtle technical choices to suggest that our definitions of rational discourse are entirely arbitrary, transient, and subject to change. In many ways, Ruocco gestures at the subjectivity of cultural values that have so often been defined as purely masculine. I find Ruocco’s use of style to engage these complex theoretical questions to be compelling, artful, and entirely engaging. In short, Dan is a wonderful addition to Ruocco’s already accomplished body of work.